Drunken Chicken Zoodle Casserole takes a spin on the original Pad kee mao Asian stir fry and puts it in casserole form. 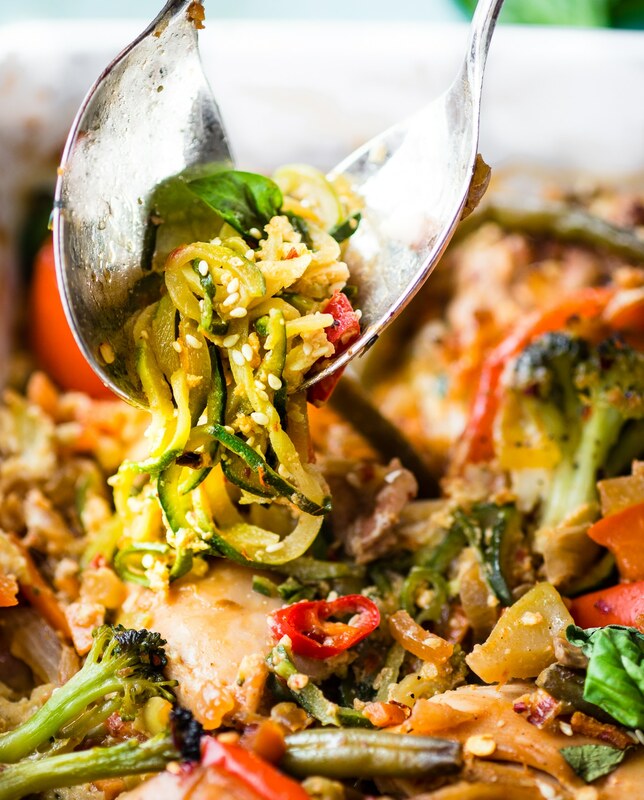 A paleo friendly zucchini noodle casserole with tons of flavor, Thai spices, and simple healthy ingredients! A delicious, light, high protein, low carb recipe. My latest obsession, among many, is making the most out zoodles in the form of spiralized comfort food. 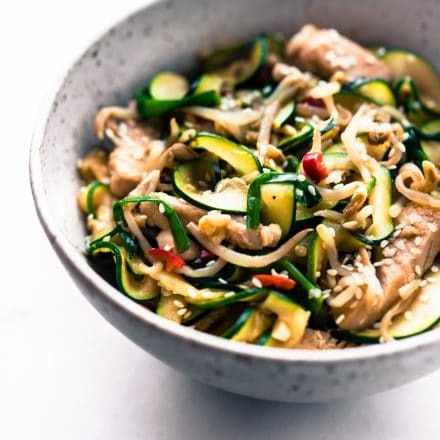 I don’t know about you, but sometimes plain zucchini noodles get boring. Heck, unless your bugs bunny, we all like to eat vegetables that have some “Ooompf !” Don’t me wrong, I love the extra veggie consumption spiralized vegetables add to dishes, but with that also needs to come more substance and/or flavor, ya know? You know I know that you know. Anyway, comfort food in the form of casseroles and Asian food are my JAM… err Jelly? Yes, noodle bowls, spicy Thai, creamy chicken curry, homestyle tuna (zoodle) and chicken casserole favorites. GLORIOUS I tell you! 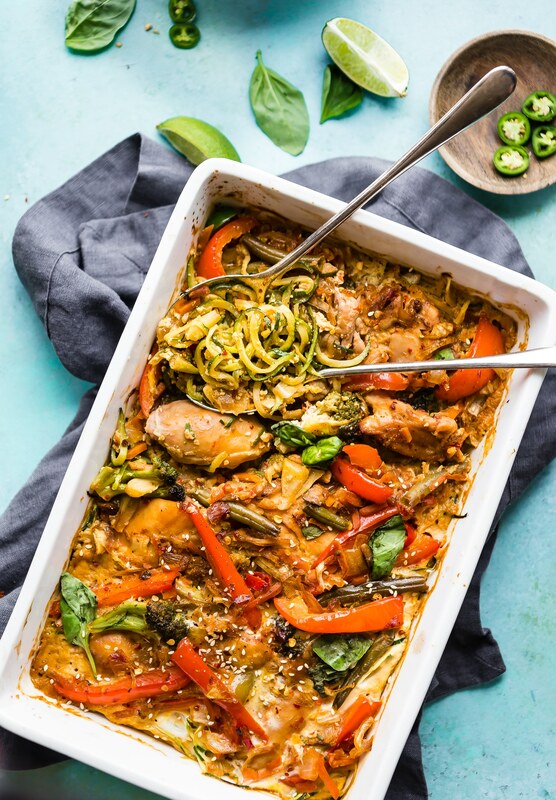 So just add this paleo drunken chicken zoodle casserole to the list. Gosh I’ve been wanting to try this for so long. Drunken noodles are amazing, but when you make them into chicken zoodle casserole form, they are even more amazing. Why? 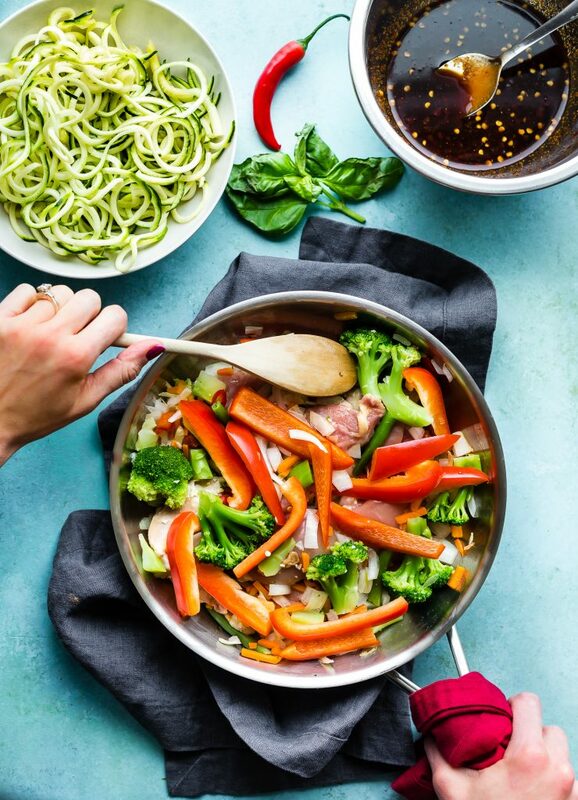 Because you can transport them as a stir fry noodle potluck dish, make for meal prep, or feed the whole family around the table. I know my Thai and Chinese foodie friends are shaking their head at me now. I might have just butchered this Asian dish, but hey, don’t knock it till you try it. The reason I chose to create a paleo drunken chicken zoodle casserole out of the original, or pad kee mao, is really for 2 reasons. Well, besides the comfort food zoodle recipes obsession mention above. Pad kee mao, includes egg. In most Thai recipes, anyway. It also contains a copious amount of veggies, herbs, spices, and lean protein. 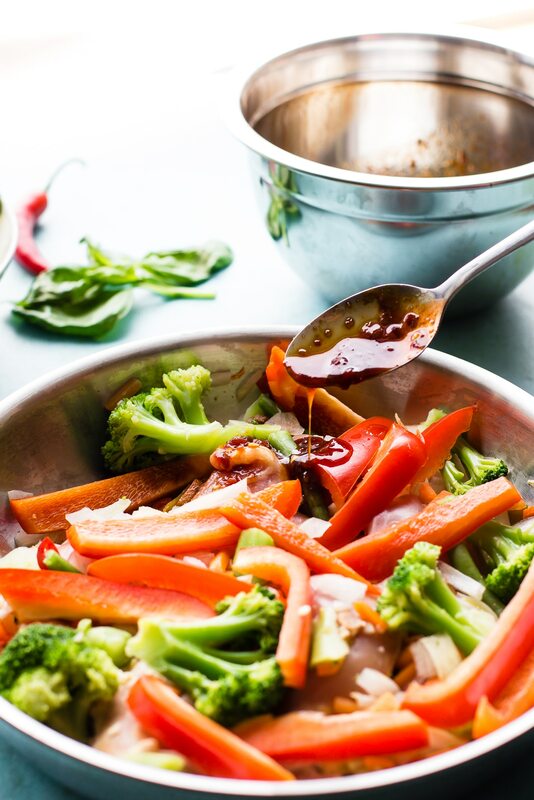 The secret really is in the stir fry sauce, which makes for the perfect casserole concoction. Drunken Noodles (pad kee mao) is one of the best of Asian comfort food stir fry noodle dishes! THRIFTY TOO! No, it doesn’t include alcohol. I think everyone has their take on this dish, but from what I’ve heard, Drunken Noodles came about by someone who came home drunk, had the munchies, and made a dish with just the available ingredients. Aka “Drunkard’s Noodles.” Oh and according to wikipedia, the other slight variation describes this dish as a stir noodle recipe that pairs well with alcohol. I’ll let you choose what to believe, mm mm k? In my opinion, Drunken Noodles stir fry is the Asian version of Mac N Cheese or any other skillet/one pot wonder. It’s simple. It’s cozy. And you can tailor it to your liking . Ha, which is exactly what I did. Chicken Casserole form ya’ll! Low carbish. Veggies packed. Protein Packed. EGGCELLENT! I used, gluten free tamari soy sauce, palm sugar, peppers, chicken, Thai basil, and birds eye chili peppers with extra jalapeños. Gasp! I know, more spice. Don’t worry, you can De-spicy this dish. It’s a word. I promise. 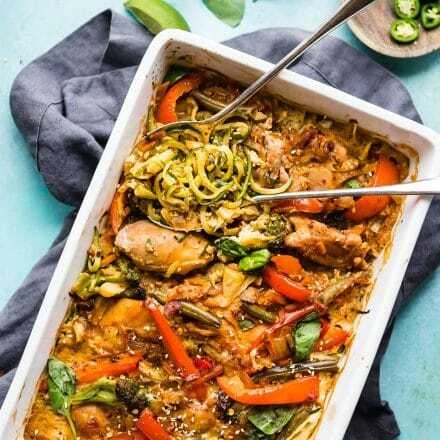 Ready to get your chicken zoodle casserole on? Yes you are! Just don’t get drunk, capeesh? 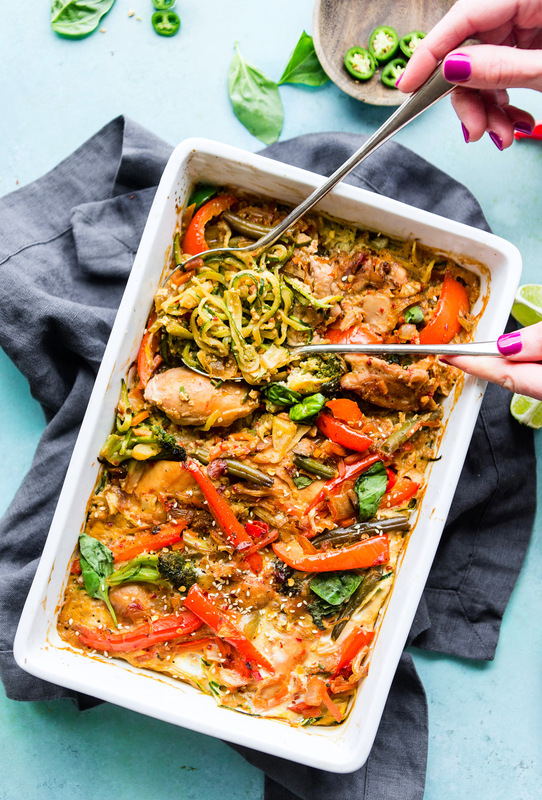 Paleo friendly Drunken Zoodle Chicken Casserole takes a spin on the original Pad kee mao Asian stir fry and puts in casserole form. Light, healthy! Clean your chicken then dice your chicken meat into small slices/cubes. Set aside. Slice veggies and spiralize your zucchini. If you don’t have a spiralizer, just cut julienne style. I use this spiralizer . Make sure to pat your zucchini noodles extra dry with a towel. To remove excess water. Next Mix your stir fry sauce. Whisk together the fish sauce, chili sauce, ginger, tamari + sugar (to equal the dark soy sauce), lime, pinch of pepper. Taste and adjust with more tamari/sugar if needed. For Paleo option, use palm sugar or molasses. Preheat oven to 350F and greased casserole dish. Set aside. Place meat, garlic, onion, oil in skillet or large pan. Sauté 5 minutes. Add your stir fry veggies, sliced red pepper, sauce, and 2-3 tbsp tapioca starch. Stir fry 10-15 minutes until chicken no long pink (but not overcooked) and starch is mixed well with the meat/vegetables. Add the Chicken stir fry with sauce on top of zoodles; evenly. Next whisk your eggs and coconut milk. Pour over casserole dish. Bake 25-30 minutes or until the edges are golden brown and the egg mix is cooked through. Remove from oven and garnish with Thai basil and optional sliced Thai peppers. Salt/pepper to taste. Sesame seeds to sprinkle over top, if desired. If you don’t have thai red pepper, you can use any other spicy red pepper. I also added jalapeno for extra kick! thai red peppers are Available in the Asian foods section or produce section of some supermarkets, or at some Asian markets. 8x 11 casserole dish is what I used. But 9 x13 should be okay, just won’t be as thick in pan once cooked. Don’t over cook chicken during the stir fry. Grab a plate, or bowl, or whatever. Fork optional. Feel free to face plant. No rules with this zoodle casserole dish! 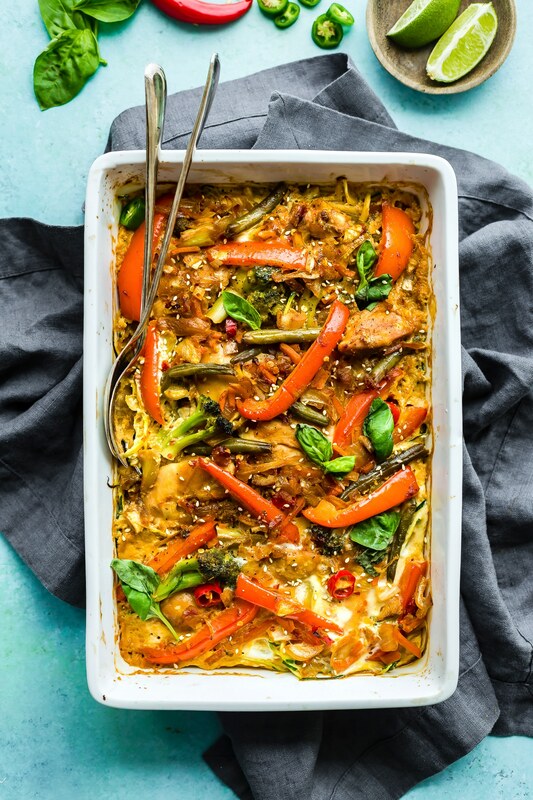 If you were to make an Asian dish into a healthyish casserole, what would you make? YUM! #Paleo Drunken Zoodle Chicken Casserole! A light spin on a favorite Asian dish! I shall me your makeover guru! That sounds like a fun challenge! Haha really! Bahaha – nope, I won’t get drunk – at least not on booze – but, if I could get drunk off of feasting (my eyes) on this – then am soused! You say “butchered” I say, “fusion” – this looks all kinds of scrumptious, lady! One of my friends and my bf are OBSESSED with pad kee mao! I had been meaning to make a homemade healthier version using the classic wide rice noodles, but now I’m 200% sold on the zoodles! 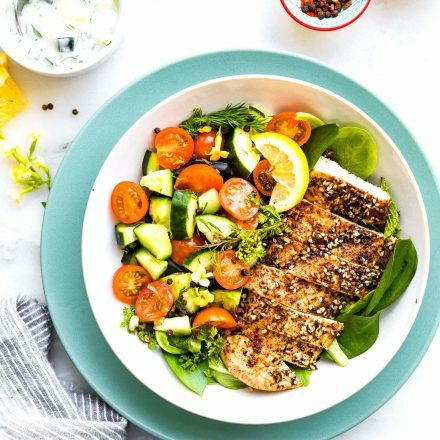 This dish looks soooo inviting and is definitely a healthier change up. Bravo, m’dear! ohhh i so should have made the zoodles wider. DARN! Next time. And thanks friend! Oh girl, Asian food in the form of casseroles is my jam/jelly too, and I’ll take it over mac and cheese any day! This looks divine! you are my food twin, i just know it! <3 you so!! This looks so creamy and delicious it’s hard to believe it’s healthy! right?? so so so good too! Yum, yum, yum! This looks so good and healthy! I love the incorporation of the zoodles too! I have ventured into trying more Asian dishes and this one looks delicious and you make it look so easy. The colors are so vibrant and the ingredients healthy, that this is a perfect dinner that includes everything you need. Yum! wonderful! Let me know if you try it Ali! You could but it would really hold together. YOu could try using a chickpea pancake (socca) mix and add on top. I have chickpea pancake and socca recipes on my site. THoughts? Looks delicious! Do you think this can be frozen? I think so, but I would not bake it beforehand. Just assemble, freeze, then bake before serving. Or you could bake it all and freeze, but the zoodles might get a little soggy once reheated. Let me know if you try it! I think so. I aim to please Vegas and The kiwi. Haha! 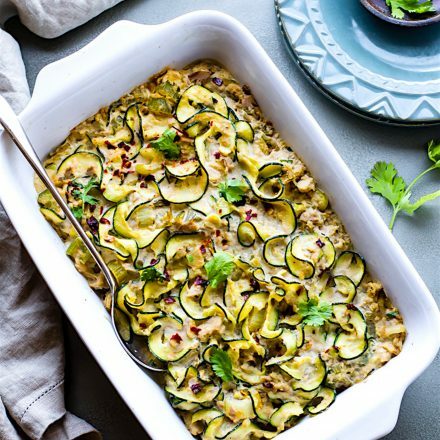 I totally agree — veggies in the form of casseroles and comfort food are so much more satisfying at this time of year. I can’t wait to try this delicious dinner!!! As much as I love zoodles, they do get boring. Not in this dish though! So much flavor in here, I’m loving all the ingredients and the easiness of it! I’m honestly so excited about this and how this will influence my dinner making decisions. woohoo! let me know what you think Hannah! yay! Keep me posted Hannah! wonderful! Keep me posted Indu! This looks amazing! Do you think it would work cooked in a slow cooker over several hours on low rather than 30 minutes in the oven? Would be fantastic to get home to a ready cooked meal like this! Are you wanting to just make it as zoodle bowl vs Casserole? Let me know. I think we could do the stir fry in slow cooker on low, then add zoodles last 20-30 minutes or so. I would just shorten the time and add zoodles last. I might try this weekend! drunken noodle is one of my fav…so clearly this is happening at home! oh me too! love chow mein! This sounds awesome! I love the idea of making it into a casserole. Can’t believe this is good for you! It’s so good! let me know if you try it Amy! I love the recipe it sounds delicious, however I don’t eat eggs as they don’t agree with me. Can you advise of a substitute I can use for the eggs. You could try just adding a bit more starch. Do you have arrowroot or corn starch? can you handle dairy? Could you substitute tofu for the chicken? Can’t believe I’m only just coming across this recipe – omg I am going to have a ball filling this with veggies! It’s like the easiest way to eat your 5-a-day without noticing you are ha! Love the casserole spin to this too! Thank you! Oh Whit! I think you will LOOOOOVE this one! Sorry to reply to a comment… I’m on my iphone and can’t find how to leave my own comment. Oh so good to hear! So you didn’t use Chicken? Just the egg/veggie? Very cool! And if you ever need substitutes for sauces that scare you (fish sauce) LOL, just message me! Are the eggs added to hold it all together or should it be more like a quiche? Kinda a mix between both. It’s really to hold it together but the eggs puff up a little . Does that help? It does, thank you! I am new to your website and have to say that I am loving it!! Wonderful!! Keep me posted! And happy to help. Hi! Looks so good! I need it to be egg-free as well…how would you recommend modifying the recipe? Thank you! Hi. I’m baking my drunken noodles and have been tasting them along the way. It already tastes good. I was surprised at how much salt is in it though when I saw the nutritional facts. Is this safe to eat?? We want the antiinflamitory effects but were concerned about high blood pressure. totally understand. You can reduce the salt or use reduced sodium tamari sauce. Or coconut aminos. Those will help reduce salt content. This looks amazing! 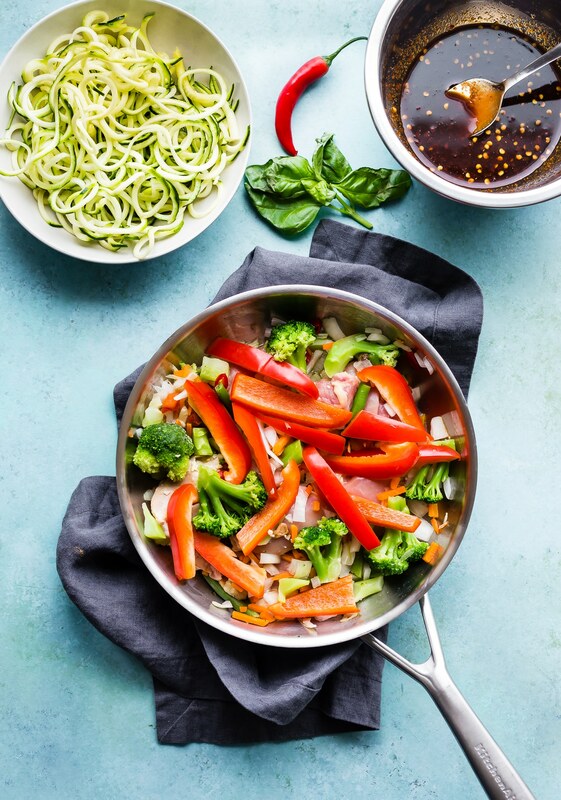 I love the use of zoodles, and I love drunken noodles, so this is a definite win! I have always wanted to try zoodles! Love the flavors in this casserole. THIS LOOKS AMAZING! Definitely adding to the weekly rotation! Could I use gluten free flour or cornstarch instead of the tapioca starch? Can you make this without the eggs? It sounds delicious but I can’t eat eggs. I haven’t tried it without eggs. You could try it similar to my tuna zoodle casserole. Maybe add chickpea flour to help?? This dish is amazing! It tastes better than takeout! awesome!! so glad. THanks sarah!